Some people love it, some people hate it.... some people are too confused by the conflicting views of it. So lets discuss PUL. cottons, the most commonly used fabric for PUL coating is a polyester, as it is thinner, more flexible and seems to work better in pads. There are different brands of PUL, and each brand might have a different look and feel. You can get PUL in different thicknesses too, so some can be thicker or feel different to others. "Procare" for example (which some people conside to be a "PUL" some don't - but it is a waterproof-coated fabric so its function is the same) seems to be a lot thicker, "vinyly" and stiffer than other brands. The "Fabrite" type is a lot softer and feels more like fabric. So the type of PUL used can really affect the feel of a cloth pad. If you try a pad with procare in it, and you find it stiff and don't like it, maybe try a pad with regular PUL, and see if that makes a difference. I've made a little video, showing a sample of a "fabrite" type of PUL and a sample of Procare. PUL is used to make a pad waterproof. Because of the plastic coating on the PUL fabric, the blood can't leak straight down through the pad, so it will spread out inside the pad more, and allow you to wear a pad longer because more of the core can soak up the blood. Without any waterproofing, a pad can leak straight through if you are not careful. reality is that it *is* needed by some people if they want an effective cloth pad that doesn't feel like wearing a pillow. There is a *HUGE* difference in the amount of flow each person has. Some flow can be more in few hours than others will have over a whole period. So obviously what works for one, will not necessarily work for another. In addition to that (and perhaps more importantly) there is also a huge variation in the *way* people bleed. Some will bleed straight down in the one spot, some will bleed more evenly over the pad. For those who bleed straight down, a pad can become soaked through very quickly (sometimes within minutes), especially if they also have a heavy flow. While those whose flow spreads out, can have more of their pad working to soak up the flow, and are less likely to leak straight through a pad. water-proof, because the basic idea behind fleece as a pad backing is that moisture doesn't wick into the polyester fleece like it does in the absorbent core material. So unless the core is very full, the blood will collect in the core instead of wicking into the fleece. The best type of fleece to use for this is "windpro" microfleece as it is a very dense fleece fabric, but not as thick as the "polarfleece" type of fleece. The fleece backing also grips the underpants well, preventing the pad shifting around. If you have a heavy flow, you may find fleece backing doesn't work as well for you. For those with a lighter flow, and/or one that spreads out over the pad more - PUL probably isn't needed. Fleece or no waterproofing may be fine. However for those with a heavy or "gushy" flow, or a flow that goes straight down in the one spot, they may find that without PUL they leak through pads very quickly. eco-friendly, can be cheaper and can be more comfortable to wear. But for those who need PUL, don't feel bad - it's a great fabric and it does a great job in cloth pads. A PUL pad is still more eco-friendly and comfortable than wearing disposable pads! however all skin does need to "breathe", which is why if you wrapped your arm with plastic wrap, it would get all sweaty under the plastic. contribute to that, is important. Some people think that a cloth pad with PUL in it is going to feel as sweaty as a disposable pad - but remember that in a cloth pad, the PUL layer will be on the bottom, so there is a lot of breathable fabric between that plastic layer and your skin. Which for most people should be enough breathability to feel different to wearing a plasticky disposable pad. Also the type of plastic used in a disposable pad is different to the coating used in a PUL fabric. The reason PUL is used in cloth pads over other forms of waterproof materials and plastics, is because PUL is supposedly a "breathable waterproof fabric" - which basically means that at a molecular level, it will allow air through but not allow water through (water molecules being bigger than air ones). If you hold a piece of PUL to your mouth you can't breathe through it, but it apparently does make a difference between using PUL near skin and regular plastic. For those living in hot climates, or during summer-time, pads with PUL may feel hotter and sweatier than pads without it. Polyester fleece can trap body heat and feel sweaty too. Especially if the pad has more layers inside it to make up for the fact the fleece isn't waterproof. Some people find even a flannel top to be too sweaty compared to a plain cotton top, and some avoid velour for the same reason - so that does come down to personal preference, how sweaty your body gets and how bothered you are by that. When used inside a pad, PUL should add only a slight thickness and slight stiffness to the pad. Something you'd probably only be able to tell if you had 2 identical pads together, one with PUL and one without. However, where PUL is its most handy for using in cloth pads, is because it can be used to make pads very thin. A pad without waterproofing needs to have enough fabric layers to make sure the pad can be worn for a reasonable time without leaking right through. As discussed previously, everyone's flow is different, so how many layers would be needed will vary from person to person - but generally speaking, a non-waterproofed pad may need to have twice as many layers of absorbency in it, than a pad with some form of waterproofing/resistance. A pad with PUL and 2 layers of bamboo fleece core, for example, should last a heavy flow person for a few hours, maybe all day - whereas a 3 layer bamboo fleece pad without waterproofing may only last half an hour and be bulkier. The more absorbent layers inside a pad, the longer that pad will take to dry, because it holds onto more water. So not only do pads with PUL allow you to have thinner pads, but they can also dry quicker because there doesn't need to be as many absorbent layers inside. (If line drying cloth pads with PUL in them, make sure you have the core side exposed to the sun to help them dry better). Bulkier pads can be less comfortable than thinner ones, and bulkier pads can trap more body heat and feel hotter to wear. To make pads even thinner, you can back the pad in the PUL, so that you are reducing the amount of layers in the pad. By sewing the core to the top layer, and having PUL as the backing, you can make pads almost as thin as disposable ultrathin pads. Especially if the pads are serged/overlocked so the edges are as thin as possible. Another concern people have with pads that are backed with PUL is the slippage. Again, different PUL fabrics will have different fabric the coating is applied to, so some fabrics may be slippier than others. All pads made with a PUL backing should have the *fabric* side facing out, and the coated side inside the pad. I've personally never had a problem with iPUL backed pads being slippery. 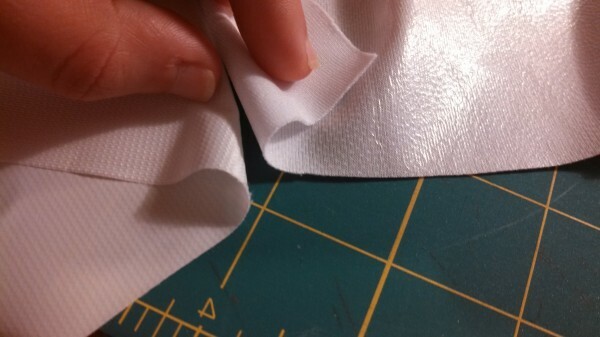 I find the "fabrite" brand of PUL to have a more grippy backing than some standard "flat" cotton backings. Because the polyester fabric is a "knit" and has slightly more texture to it than a "woven" flat cotton. Since fabrite no longer make their PUL, I've had to go looking for alternatives and some of the ones I have tried are a tiny bit slicker (less grippy) than the fabrite one, but I still think they are fairly even in terms of slippyness with a cotton. Some of the PULs being just slightly more slippy than a cotton backing. When wearing cloth pads of any kind, they do work best with snug fitting cotton underwear. The cotton underwear provides the best grip with your pad, and the snug underwear means the pad is being held against your body firmly, so lessens the chance of the pad shifting around. So PUL backing is a tradeoff between having a thinner pad, and the potential for it not to look as pretty and perhaps not grip as well as if the pad was backed in flannel/cotton/fleece. PUL has a limited lifespan. What that is though, seems to depend from brand to brand. Some say it will last at least 50 washes, some say 1,000. Washing pads with disinfectants, vinegar etc. can affect the lifespan of the PUL. So a pad with PUL in it, should last you a few years (or more) - the more careful you are with them, the longer they should last. A lot of pad makers advise against putting PUL pads in the tumble dryer. Mostly this is to ensure you get the most use from your cloth pads, so that dying them doesn't decrease the durability - but also because while lots of people tumble dry PUL pads with no problems, occasionally you hear of someone doing it and having them melt - so it's usually best to recommend against tumble drying them, just in case. This is a FABULOUS overview of PUL - incredibly thorough and helpful. Thank you! Of course you can - but I was specifically addressing the point of using PUL as the backing, since that is one of the common questions/complaints/issues I've seen. You can do what I call "hidden PUL" with any form of backing - flannel, cotton, fleece.... whatever you like. It doesn't need to be fleece. The video shows a pad with PUL backing and one with the "hidden PUL" with cotton backing. Thanks for taking the time to write this up Obsi! I love the bit "Some flow can be more in few hours than others will have over a whole period.". So true, some women have short but heavy/gushy menstrual flows. This makes me want to do a major de-stash, ha! Here is a photo of Procare (left) and PUL (right). The Procare (left) has more of a vinyl and stiff texture like those water-proof sheets used in hospital/children bedding. The PUL (right) is thinner and more flexible and not as stiff. Thank you for taking the time to write this up! I was drawn to fleece-backed pads because of all the negative opinions I had read about PUL. 2 years and wayyy too many pads later I discovered how much I love the thinness of a PUL or Procare (LOVE Procare) backed pad. I can wear a waterproofed pad so much longer than a fleece-backed pad while still being comfortable. I also completely agree with Dalya on waterproofed pads backed with cotton and how much BETTER my experience has been when dealing with the hot, humid, Florida weather. Thanks again! Your expertise is priceless! !